Sometime in high school, I had to sell items for a fundraiser. I bought a set of Rocky and Bullwinkle fan pulls to attach to the chains of my ceiling fan and they lived there for years and years. Even though I haven't lived in that room for quite some time, my mom still keeps Rocky there - I don't know what ever happened to Bullwinkle. Anyway, Andrew saw these when we were dating. He said that his family had a Bullwinkle holding a star that they put on the top of their Christmas tree every year and it was one of his favorite things about Christmas. I thought that was cute. 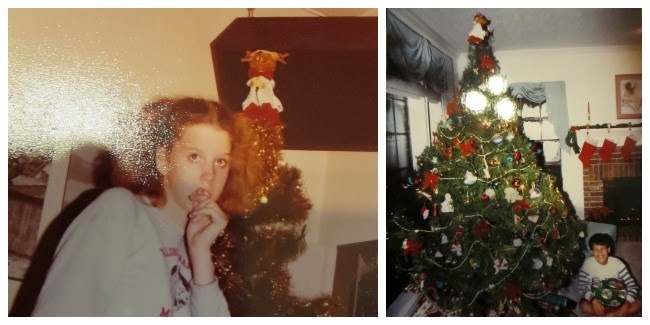 A few years later, Andrew's dad got all of the family Christmas decorations out of storage and had them sent to our house for our first Christmas cohabitating. We got everything out and Andrew told me stories and memories behind each ornament. And then he got to this... thing. A paper maiche animal with antlers wearing a red and white dress. "Bullwinkle!" He was happy to see this relic from his childhood after years of not decorating a tree. "Ummmm... what is that? It doesn't look like Bullwinkle." Clearly I was not a fan. "It's Bullwinkle. In his choir robe. He goes on top of the tree." In the way that you can never tell a child the truth about Santa, I couldn't tell my husband that his beloved Bullwinkle was in fact, probably a reindeer wearing a dress. So it went to the top of the tree. I never had the privilege of meeting Andrew's mom, but I know his memories of Christmas are closely tied to his memories of her. 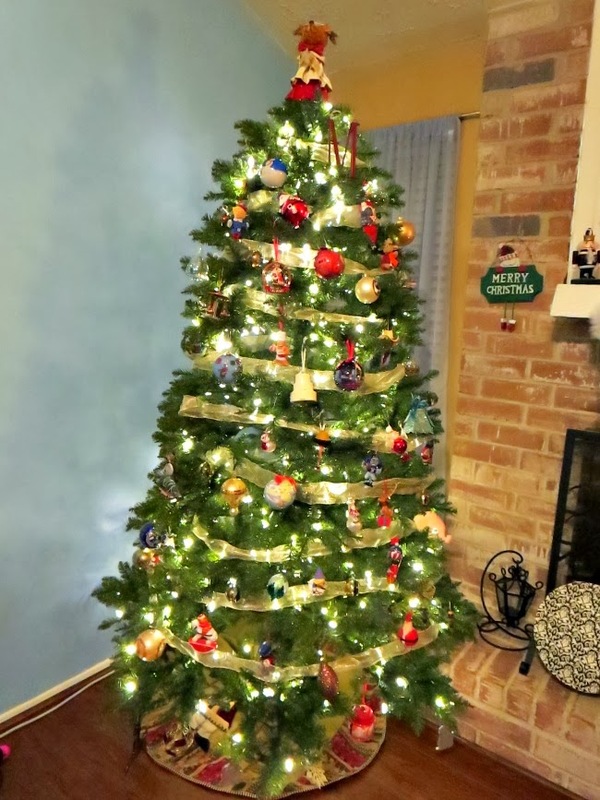 In the box of ornaments and decor, I found a Christmas tree topper that was more my taste - gold metal, a sunburst of stars to come off the top of the tree. I asked him if we could try that one year. After all, his mom chose it so it would still have that family connection. "No," he flatly told me year after year, "Bullwinkle goes on top of our tree. It's my only family tradition." And so Bullwinkle has kept watch over us each Christmas season for the past several years. I have repeatedly accidentally called Bullwinkle an it, or even worse, a she. 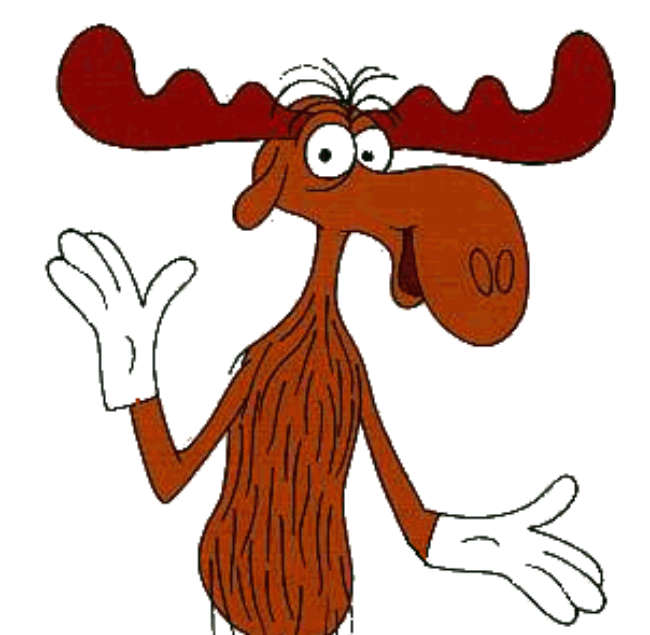 Every time I receive a death stare and a simple "But I love Bullwinkle." 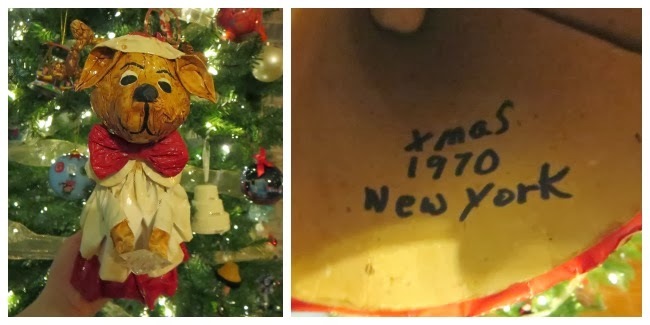 Every year I work hard on making our tree pretty, only to resign myself to the fact that this artifact (the date beneath Bullwinkle's skirt robe says 1970) will have the top spot, essentially disrupting the gold and glittering Christmas tree vision I imagine. "Bullwinkle is an old man. He deserves your respect." I heard this last year, so I bought Bullwinkle his own home for 11 months out of the year - a tupperware shoebox that he lives in, wrapped in bubble wrap. I hope he's very happy there. So if you see my tree, or anyone else's for that matter, this year, and it has some... interesting decor on it... please be kind. Ask about it. 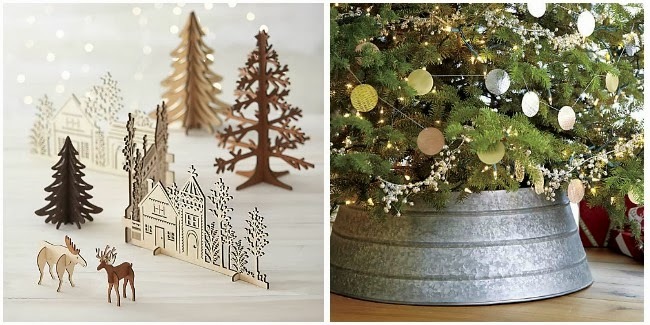 Some of us don't deck our trees in Pottery Barn at Christmas. Some of us don't live in homes straight out of Southern Living. Some of us live with a man who will always be a little boy, missing his mom, wanting something simple to remind him of the magic and tradition of Christmases past. Our tree, this year. Bullwinkle and all. But you better believe I held on to that sunburst-star topper, in case he ever changes his mind. I was at a wedding last night (on a Sunday. Weird, right?) so I didn't feel like blogging at my regularly scheduled time so here I am, late. But I think we are all in vacation and short week mode so everyone will probably be looking for an excuse to not do real work today so surely you will see this. Right? Anyway, the weekend. Saturday was busy. I wanted to unplug and I accidentally left my phone at home for four hours and I felt so out of touch. Andrew wanted to scratch another restaurant off of the Top 100 List, so we went to La Guadulapana for breakfast. It's in a tiny strip center with a convenience store and a washateria. I hate eggs for the most part but figured when in Rome, so I got the Omelet Especial because it had veggies, meat, cheese, and was covered in ranchero sauce. It was actually really good and didn't taste egg-y at all. The beans were my favorite part, though, and I wish there had been more of them! Andrew got a seafood soup that smelled terrible (but only to me) and some tamales. He loved the soup, called the tamales dry. The food was pretty good but the service was awful. It took repeated requests to get water refilled and forever to get our food. If you have the opportunity to go on a weekday, I bet that would be a better experience! We continued with being "in town" by going to Blacksmith for coffee and then to Revival Market. Revival Market is a market/store that sells and serves nearly all local produce and food items. I basically wanted one of everything. This restaurant here, Hugo's serves the best hot chocolate and Revival Market sells tablets to make your own at home but they were out of them. It was a sad day. But we got some Bourbon Cajeta (goat milk caramel) and it is delicious. The rest of the day was filled with other errands, like a Trader Joe's run, buying a wedding gift, and finally getting new boots because the heel was coming off of mine. I know I rarely need boots in Texas, so it was far easier to justify a new pair when mine were broken. Simple food and simple presentation. That bowl of soup was huge, though. | Bourbon cajeta (and it's local), yum! Oh, and I also decorated the house for Christmas. But I am sure that will get a post of its own, eventually. My cousin's wedding was last night and there was an open bar. If you follow me on twitter, then you already know that I was traumatized by my mom and aunts on the dance floor. And that Walter White Heisenberg's lookalike was there and I almost peed my pants watching him dance. I mean, he is the one who knocks and all. Almond croissants from Trader Joe's that we had with pumpkin butter - YUM! and so easy | See, doesn't he kind of look like Walter White? I'm loving that I am already a few hours into my two-day workweek. Now, to go try and get some work done! Linking up with Sami and Leeann! Here is proof that I will never be a food blogger: after just two days of food-centric posts, I'm don't want to write any more! So, instead, here are some things worth knowing today, on Thursday. 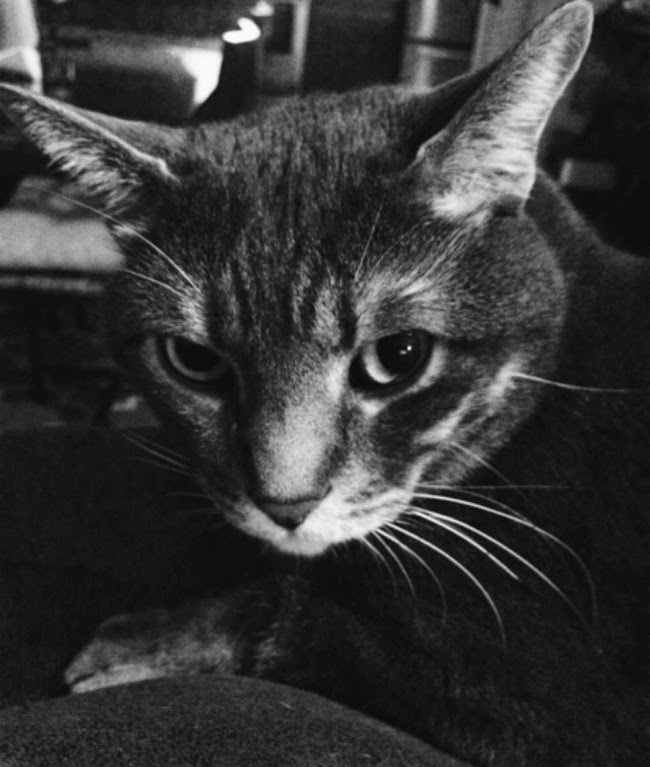 This picture has nothing to do with anything; I was playing with the VSCO app and thought Bauer looked very gentlemanly. 1) I should clarify a few things from yesterday's post - first, the portions were pretty small so while 23 courses was more than enough food, each course was nowhere near a normal restaurant portion! And second, my husband thought it was very important that I share with you that we went to this dinner a week after the Giants won the Super Bowl - as season ticket holders, we were able to buy tickets to the game and resell them for a very nice profit. If not for that, the meal never would have happened. Just thought I would share that because I know that I would be wondering how and why someone would have a meal like that! I believe this is known as keepin' it real in the blog world. 2) Since I am trying to be industrious and get as much Christmas stuff knocked out as possible now, I wanted to make sure y'all are using ebates. You are, right? It gives you cash back on your purchases and lets you know if there are any coupon codes you should be using. If you would sign up through this link I would be oh-so-appreciative. It was so nice to get a check for like $50 after doing my holiday shopping using ebates last year! 3) Speaking of Christmas, I am still trying to hold off on listening to Christmas songs, but I did want to share my three favorite lesser-known songs: 1) Need a Little Christmas by Johnny Mathis (it was playing as we got engaged) 2) Donde Esta Santa Claus? by Guster (This is the version I prefer. Andrew hates this song with a passion so I like it even more!) and 3) Cold December Night by Michael Buble (He wanted to create his own special Christmas song and I love it!). What are some of your favorite lesser-know Christmas songs? I want to add some new things to my Spotify playlist! 4) I often feel behind on blogging. This week is one of those times. I figure people would rather get a comment on their new post than a response email from me from my post a few days ago. Is that right? I will catch up, one day, and I am trying to be better about sending responses as soon as I read comment emails - because you better believe I read them the second I see them. Just life, ya know? 5) I'm going to a wedding this weekend and the high is going to be 51 degrees. That is so rare in Houston and I have no idea what to wear. This is causing undue stress. I should mention that it's my cousin's wedding so the only people I will know at the wedding I have known my whole life and it really shouldn't matter. The more I blog and pay attention to other people's clothes, the more I realize how ill-equipped my closet is for any situation besides being mostly a bum and going to work. Perhaps "dressing like an adult" should be added to my New Year's Resolution list. So I think these are enough things for you to know on this lovely Thursday going into a holiday week. I don't know about you, but I am really looking forward to only working a few days next week and then fully immersing myself in the Christmas season! Today I am still marking the transition from Method to my Madness to Eat, Drink, and Be Lauren by sharing the best meal I ever had with you. 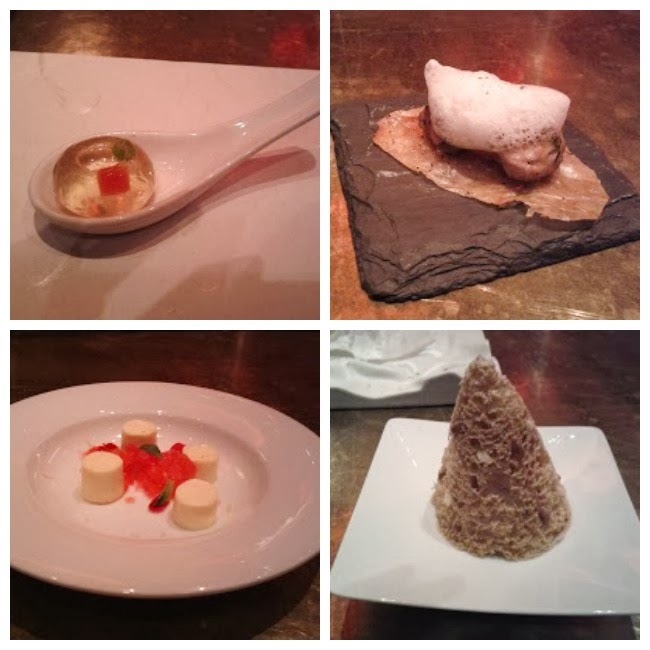 The best meal I ever had was at e inside of Jaleo at the Cosmopolitan in Las Vegas. You make reservations a month in advance and once they are confirmed, you get a gold ticket in the mail like Willy Wonka! 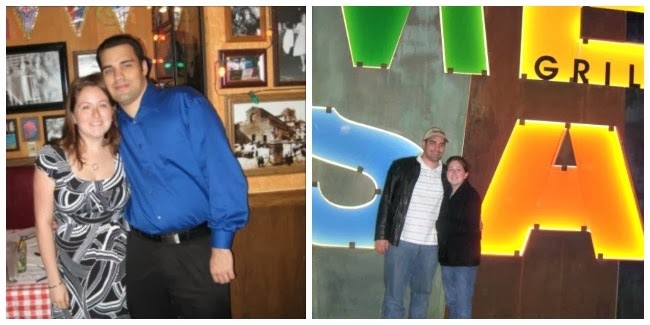 We went on Valentine's Day 2012, which is our dating anniversary. I call it our mortgage payment meal because yes, it was that expensive. You have to have the full meal, which was 23 courses when we went. We told them I was allergic to shellfish and morally opposed to foie gras because I don't like either, but that sounded nicer. We had both the alcoholic and non-alcoholic beverage pairing. A potent cocktail in a perfume bottle was at every place and it was delightful | Drinking my perfume drink | Andrew was more comfortable with the perron. It was a three hour meal that started at 10pm Texas time and lasted til almost 1am. The beverages were potent and I don't completely remember the final courses - I was tired, sated, and ready to be done. The chefs almost dance as they prepare your food. There are two seatings per night, with eight people at each seating. You can ask any question you want and every dish and ingredient is explained to you in great detail. You can watch your meal as it's plated with tweezers. 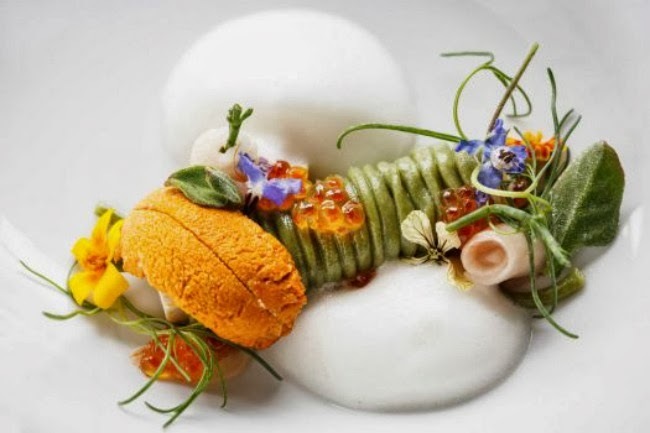 The attention to the plating is amazing, really. I have been so busy in the best way this weekend that I kind of don't want to blog. But much in the way that a new outfit for work makes Monday more bearable, the idea of "showing off" my new name and design makes the idea of forming real sentences more appealing. - Friday we carpooled and went to dinner at the food truck park. Several years ago, there was a Cuban place by our house and I fell in love with Cuban sandwiches (ham, pork, swiss cheese, mustard, and pickles on grilled, yummy bread). Well, that place closed and there is nothing that has totally filled the void for me. I heard that a food truck had an amazing Cuban so I had to have it and.... it wasn't what I imagined. Couldn't taste the cheese and there was aioli instead of mustard. However, the house made ketchup and the aioli for fries was worth going back for. It's called Speers Rolling Bistro for all my local friends (and the lady recognized me from tweeting to them so that was cool). 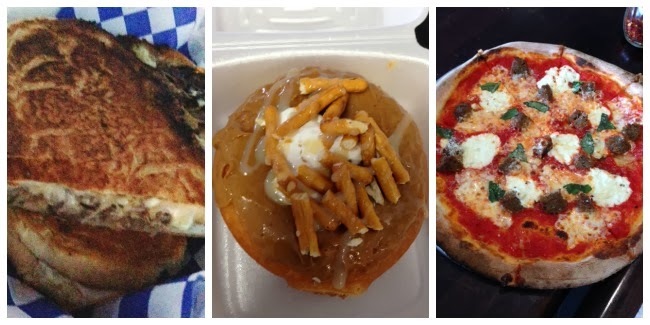 - On Saturday, we tried The Grove Donutz and Deli thanks to Bre's instagram. They have all kinds of crazy donut flavors like tres leches, cookie butter, rocky road, and s'mores and boudin kolaches (if you don't know what those words mean, let me know because they may warrant their own post). They also make their own version of the cronut (remember when I tried the "dosant" elsewhere and it sucked?) so together Andrew and I got their cronut holes (yum, flaky with cinnamon and sugar), a caramel macchiato donut (loved the texture, pretty good), a boudin kolache (hated it), and a tres leches donut (also yummy). It is worth the drive for a breakfast treat every so often! - I also had a lady date with my for real, no disclaimer needed friend Sara on Saturday. You may remember her as Sara in Texas or Simply Sara Elizabeth but she isn't blogging anymore. We spent over an hour at Sam Moon, which is like Charming Charlie with less organization and cheaper and bigger and then had lunch at Pizaro's with a bottle of Prosecco. And lots of catching up. If I hadn't had so much to do at home, I think our date could have lasted well into the night! - Quick rundown of Pizaro's - it's BYOB and the pizza is thin crust and made with high quality but low quantity ingredients. I have never had a bad pizza there. Sara and I got one with meatballs, ricotta, and basil and it was delicious. It's inexpensive in my opinion and so, so good! The menu is really only pizza and salad and it isn't much for ambiance but the staff is friendly and it's super casual. - For Sunday, I was given free tickets to the Texans game by a coworker. Andrew didn't want to go, so I invited my dad. Our seats were nosebleeds but I don't complain when they are free. We had the genius idea to park at my office and ride the lightrail to the stadium to save money. Well, that was great for getting there, but when we left, about eight blocks from our stop, we were kicked off the train because there was an accident ahead blocking the tracks! So it was a 12 block walk in 85 degree weather after the long walk down from the nosebleed section and across the parking lot to the rail stop in thin sandals not meant for walking. 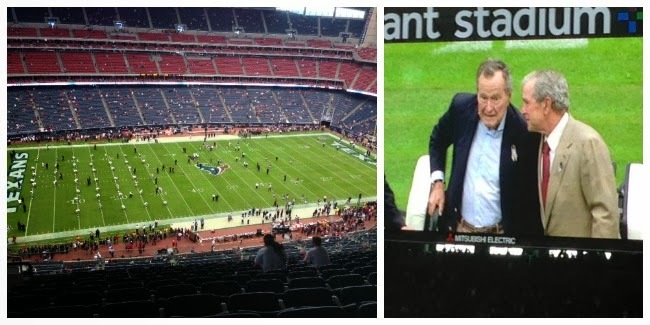 And the Texans lost. So I have pretty much decided that Texans games aren't worth the effort for me. They aren't my team, anyway. But, it was nice to spend time with my dad. And on Saturday night during my free time, I was busy with blog design because when you are stubborn and doing DIY, it is time consuming. 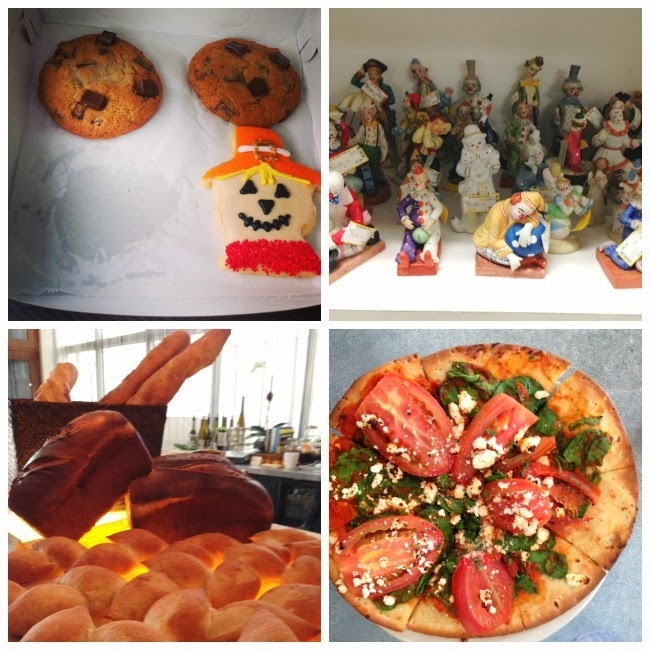 This week to celebrate my new name, I am planning a few food-centered posts. I think some Eating and Drinking emphasis will be fun to write (also - who doesn't love having blog topics thought of a week in advance?). After Friday's "tease" that a change was coming and your sweet comments looking forward to it, I found myself dying to sit in front of the computer tonight and just change everything. I compromised and just changed a few things. More will come, but I took care of the big stuff now - namely, the header, my button, and my twitter (@eatdrinklauren) and instagram (eatdrinklauren). Why Eat, Drink, and Be Lauren? Well, like I said before, Method to my Madness just didn't feel like me. I think those of you who know me know to expect food pics and recommendations and stories about the food I have eaten lately. And if I'm not talking about that, I'm talking about being me - what I like, what my life is like, what I am annoyed at right now, and more. Being Lauren. Plus now every time I think of my blog name, I think of "Tripping Billies" by Dave Matthews Band which isn't a bad thing. And I incorporated "Eat, Drink, and Be Married" into my wedding. And I clearly have a leaning toward using common phrases as blog names. And I just like it, okay? So, other than a new name, I plan to blog about the same things I did before. I don't want to be a critic or a reviewer - just someone who enjoys food. I just wanted to let you know that you're in the right place! Annoyance of the week: whining over first world problems. We all have them, but if all I hear from someone is how hard their life is, then honestly? I don't want to hear what they have to say anymore. I am far from happiness and sunshine all the time but I try really hard to keep perspective and be happy about little things. And these are some things currently making me happy on this lovely fall Friday. 1) The anticipation of Christmas music: This is the shortest that the Christmas season could ever be, I'm pretty sure, so it feels like Thanksgiving is taking its sweet time getting here and Christmas will be here and gone before we know it. I am trying to force myself to not listen to Christmas music (specifically, Michael Buble's amazing CD. Get it now and thank me later!) until at least the week leading up to Thanksgiving. But it's so hard. Looking forward to it is making me excited for the whole season, though. 2) Hot chocolate: Coffee is great year-round, but I can only do hot chocolate when it's cold. This week, it was cold and the hot chocolate was amazing. I grew up with powdered hot chocolate mixed with water but of course now have upped my game to fancy hot chocolate shavings with milk. YUM. The Williams-Sonoma hot chocolate mix makes a great gift, just saying. 4) Time to be: The last few weeks, I have been stressed and tired and just... ew. This week was great. I have had time to answer emails, read blogs, keep up with twitter, watch TV, gchat, and just do little things that make me happy. Sometimes life gets in the way of the little things and I'm glad that wasn't the case this week. 5) A change is gonna come: I started blogging under a completely different name and then went with Method to my Madness because... I don't know, I liked how it sounded? If I came across my blog name, I would think it was about a woman who was blogging about living with a mental illness or something. I know what I mean by the title, but it isn't easy to figure out from the get-go. After lots of brainstorming, I think I have come up with something simple that will be my new online identity. Much more me and and a better idea of what my blog is about. Plus, I will finally buy a domain. I am super excited but committed to staying with DIY blog design so it might take me a while to make the swap. Hopefully it will be sooner rather than later because I am ready to change my twitter and instagram right now! I hope to spend my weekend having a new food experience or two and maybe getting some Christmas shopping done. Hope you have a great one! It's Andrew, Lauren's husband (hubs, Mr. Man, whatever other clever names you ladies come up with for your significant others) again. You may remember me from a previous post I did for Lauren (there would be a clever link to it here, if I had the patience/knowledge on how to insert a link). One small change for this post: Lauren doesn't know I'm writing this, and it will publish without her knowledge. She's having a case of writer's block tonight, but really wanted to post. This is my hopefully not lame attempt at helping out my darling wife. As Lauren has gotten more involved in the blog world and made so many friends that I hear so much about, it has provoked some thought on my end. 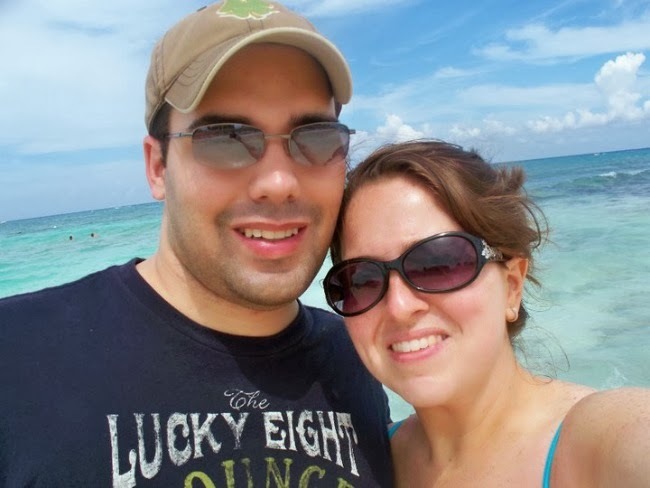 Are other "blog husbands" as invested in their wives' blogs as I am in mine? I read every post, will scan the comments to see what everyone has to say, and try to help her come up with ideas for future posts. While I hope this has helped her in her quest to have a quality blog - I think most of you loyal readers will agree her blog is entertaining - I think it has helped me better understand my wife. She talks about things on her blog that just don't tend to come up in normal marital conversation. I think it has helped me grasp her thought process and, possibly, helped me get a better idea of how to communicate with her. She NEVER, and I mean NEVER, gets out the door on the first try. She always forgets something. If she does get out the door without forgetting something, she will undoubtedly think she left her hair straightener on and go back in the house anyway. She calls her cat approximately five different names per day. She changes outfits a minimum of twice when getting ready for a blog friend meet up. Is this normal? We have an inside joke/funny "look" she makes sometimes, and she made the silly look in the middle of our wedding ceremony. No one noticed but me of course, but it is one of my favorite moments of our 7 1/2 years (and counting) relationship. It was my wife in a nutshell, and it was perfect. I have noticed by reading blogs and speaking with other women as well as watching movies and TV that there is a trait many women share: they cry fairly often. Whether they are happy or sad or mad, tears from the eyes seem to be the norm. The more I pay attention, the more I realize that a lot of women cry pretty often. So of course, I have to sit back and realize - I don't. I was a bit of a crier as a child. Mostly because I was sensitive and if I got a grade I didn't think I deserved or was with a group of students who got in trouble but felt like I was innocent in the matter, I cried. And I was usually the only one. So maybe that traumatized me into not crying as an adult? I mean, I cried at my wedding. I almost cried during Jim and Pam's wedding on The Office. Someone went into my office yelling at me about how I was going to get the company sued when I worked at my current job for less than a month and that got me pretty teared up. But honestly? I can't remember the last time I really cried. I'm not sure what is is that makes some people cry easily and some little, if any. "Having a good cry" rarely sounds like a good idea to me. If a person or situation makes me want to cry out of anger or frustration, I always see it as letting that thing win, and let's face it - I want to win! I don't think I'm an unfeeling jerk, but crying just doesn't come naturally to me. I am far more likely to cry over something sappy, but even that is just tiny tears that don't even make it all the way down my cheeks. Am I a mutant? Or so I just have my emotions in check? Am I missing something? Is there really nothing better than a good cry? I worked until 1 a.m. Thursday night, which was unfortunate because I planned a spa day at a fancy hotel across town beginning at 10 a.m. Friday morning (not a real problem, but I was tired). I think the spa day will go in a post of its own. I had gift cards and I mostly enjoyed it, but is it normal to feel bruised after a massage? Anyway, I did that, stopped for cookies to take to Andrew at work, and then came home for the most amazing two hour nap I have had in recent memory. Andrew came home and woke me up and I thought it was morning and mumbled something about how "Holly/Heidi said I was next in the system." I don't know what I was thinking and I think I said Holly but Andrew heard Heidi so maybe my bloggy BFF was in my dreams? I have no idea. Anyway, Saturday is where the weekend got good. 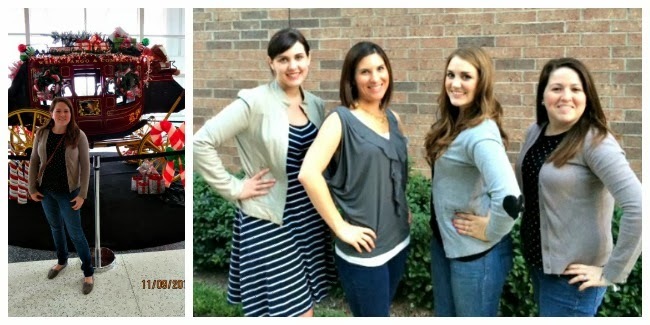 Sarah, Miranda, and I met at Rachelle's to check out some of Houston's best resale stores. We went to three different stores and I'm the only one who bought anything (a vintage coffee can to match my antique toaster and a wooden tray to go on the back of my toilet that I snatched up when Rachelle decided she didn't want it). 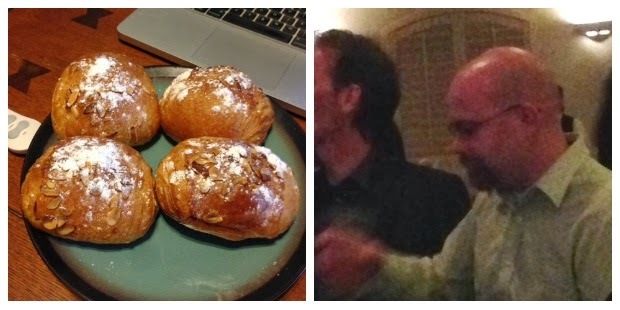 Then we had lunch at Paulie's and decided to check out a bakery pop-up that Andrew texted me about. Pizza and maracons and coffee, YUM! So after all of that, we decided to check out the Nutcracker Market. For those not in Houston, Nutcracker Market is a huge sale put on by hundreds of vendors in an arena that has all kinds of holiday decor, gift items, jewelry, bags, and things you never knew you needed. Miranda and Sarah had never been but Rachelle and I knew what we were getting ourselves into! I tried to refrain from going crazy (plus I still had to carry everything I bought) so I only ended up with a bracelet, a Christmas ornament, and a slate lazy susan that I am going to put in my Christmas gift stash. Being there always makes me ready to decorate my house for Christmas and break out the Michael Buble holiday CD, but I refuse to do so until after Thanksgiving so we still have a few more weeks. It ended up being a fun, jam-packed day with friends. Sunday consisted of a Giants win and brisket and homemade mac and cheese by the husband. Also, two cups of French Press coffee. It is so easy and tastes so good - how have I lived so long without this in my life? I meant to spend the day catching up on blog reading but it just didn't happen. Maybe with things slowing down at work, I can catch up! You have probably seen the article posted all over facebook called "Marriage Isn't For You." Aside from the clever title that did make me click to learn more, I wasn't convinced. The author, who has been married for all of a year and a half, basically realizes that he got married for his wife: to see her smile, make her laugh, and be a good part in her life. And that's great! You should want that in your marriage. But I really don't think most of us get married for those lovely, selfless reasons. I think that's a part of it, but we mostly get married for ourselves. I know it's Wedding Wednesday, but you're getting my favorite honeymoon pic instead. Granted, I have never lived alone, but I think being married makes my life easier. Two incomes (or a person with extra time to keep up with the house) are amazing, right? And I love that the things that I am awful at, he is great at. He forgot to feed the dog? No big deal, I'm home to take care of it. We need coffee? He can stop at the store. We're going through life together and, while I love that I can be there for him, my knee-jerk reaction is that I love always having someone there for me. I am not very good wife material. I have written many posts outlining my faults on this blog in a short time. I am lucky to have my husband; he shows his love by doing things for me. I forget to show my love in any good way most of the time. I definitely got married for me in this case. I have a tendency to get caught up in my own head and neglect to be about him more often than I should. The so-called selflessness of love gets lost in the day-to-day. You get cranky, you have bad days, you step in ants and wonder why he hasn't killed them yet. He can't believe you still haven't done dishes. But you need one another to get through the day to day. He needs me to hop in on one foot flailing like I got bit by a shark and not an ant so he can laugh at my dramatics and I need his... nudging as an excuse to be sassy and ask if he has a sudden water allergy I should know about that has prevented him from loading the dishwasher. You don't think about it and you don't do it for the other person - you do it because it's life and you're married and you're committed, and it's the only way you know how to stay sane. I don't do silly things with the intention of making my husband happy; I do them because they come naturally to me. If he didn't think bad jokes were funny, then he wouldn't have chosen me. I feel that the writer of the article says that making your partner happy is always at the forefront of your mind, and that just isn't the case. On any given day, the forefront of my mind is filled with turning off the straightener, recent tweets, weekend plans, and wondering where I left my phone. Making my husband happy and feel important and laugh are all very important to me, but I think with the right person and the right situations, it just happens. It's not an active thing - it's just life. I want to try to make him happy, sure, but if watching ESPN makes him happy and watching Parks and Rec makes me happy and I have the remote, whose happiness will matter most in that moment? Mine. And Leslie Knope's. We got married for us. We value one another, and we like the way the other makes us feel. I don't live in a fantasy world where I think I can make my husband's life better all the time. I just can't. But I can be there for him, and with him, and make bad jokes when he needs one. And when he drives me crazy, I can try to remember all the good he does for me. I'm lucky he chose me. Except when I have ant bites on my feet. Then I wish a slightly more outdoorsy version of him chose me. What did you think of that article? Who is marriage for, anyway? Last night, Andrew and I were driving home and I was hungry. He can't stand a soggy sandwich so he brings the sandwich meat/cheese/etc. home in case I want to make a sandwich for my lunch during the week. So, I did what seemed natural to me and grabbed a slice of deli cheese (Vermont cheddar, yum...), gave him half, and we chowed down on cheese at a stop light as I realized how unnatural that probably was. I happened to be texting Joey at the time so set the scene for her and ended it with "I just wanted to let you know what kind of person you're friends with." And since we are all friends here in our own way, I want to let you know the kind of person you're becoming friends with. ... Makes up silly songs to the tune of whatever song is in my head while I wash dishes. ... Cries real tears when onions are cut or cooked. ... Is loyal to the people and things that I have chosen to love. ... Loves macaroni and cheese and will try it in nearly any iteration in hopes I've found a new love. ... Will keep score and always try to repay you for a good deed. ...Craves Diet Coke the second I walk in the door and contemplates a trip to Sonic to fulfill that need daily. ... Believes in respectfully disagreeing. ... Wears pants to cover up a lapse in shaving my legs. ... Eats cookie butter by the spoonful standing over the kitchen sink. ... Snuggles with my cat before my husband (Andrew understands English; Bauer doesn't!). ... Will probably never spend much time on my make-up, hair, or clothes. ... Is probably irritated with my husband if I'm not giving him a hard time. ... Loves to go against what everyone else is doing, just to do it. ... Always thinks a Gilmore Girls episode is the best thing on TV, no matter what. ... Will immediately wikipedia something in order to prove a point or answer a question. ... Wants to strike up a conversation with nearly anyone. Those are just a few things about me. What kind of person are you? I was ahead of the game and scheduled last week's posts on Tuesday so I feel really... out of the blog world. I started to get sick Thursday night so I used that as an excuse to catch up on DVR and do nothing all day Saturday. It was everything I thought it could be. Since you don't want a recap of all the things I watched, how about I write down what I did on Thursday, my birthday, for posterity's sake. I am a firm believer that your birthday is your day. Whether you want to stay in PJs or go to the spa or just hang out at work basking in birthday wishes, it should be what you want. My coworkers were sweet enough to bring me surprise breakfast, fun gifts, and a thoughtful scavenger hunt on Wednesday so I could take off on Thursday without feeling like I missed out. And it was simple and perfect. I woke up to a monsoon in Houston, so I was grateful to not be making my thirty mile commute. I lounged around and enjoyed the Halloween costumes on GMA (seriously, could Josh Elliott as Ron Burgundy be any cuter? No, he could not!). I responded to sweet tweets and texts and phone calls. My dad called and invited me to lunch. Normally, I would say no, that he didn't have to, and that I would rather just be alone, but I thought about it: when was the last time I spent my birthday with my dad? My parents got divorced after I turned ten, so probably since then. So I put on my rainboots and had burgers and Starbucks with my dad, just the two of us. And it was nice. I strongly encourage it, actually. I mean, I'm guessing as a parent your kid's birthday is pretty important to you too, right? When we were done, I took myself to Target. I love to be in a store on a weekday and avoid the crowds. I spent tons of time with the clearance racks and got a French Press for $3.28 (I was about to spend $20+ on one so this was great for me!). Andrew got home and we had fajitas, margaritas, and cupcakes. It was lovely. Except at dinner when I sneezed and then my head felt full and I felt like I suddenly had a cold. That wasn't lovely. 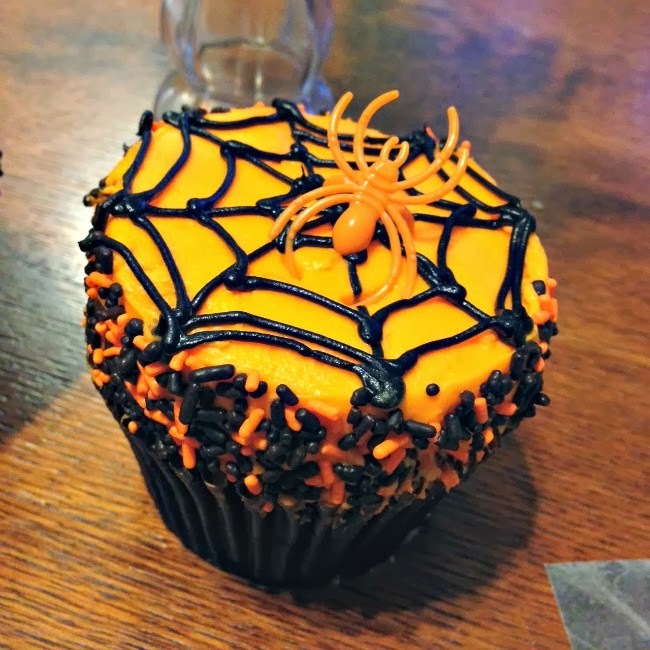 One advantage of a Halloween birthday... really cute cupcake options! So that's why I was a bum on Friday and Saturday. And on Sunday, my oldest friend invited me to sit around her house and hang out since that is how we first bonded when we became friends ten years ago. Because I broke up with my boyfriend on my birthday. So really... there isn't much to say about this weekend.